People always say you should upgrade your RAM. But what is it, anyway? Random access memory, or RAM, is one of the most important components of not only desktop PCs, but laptops, tablets, smartphones, and gaming consoles. Without it, doing just about anything on any system would be much, much slower. Even not having enough for the application or game you’re trying to run can bring things to a crawl, or make it so they can’t even run at all. But what is RAM? In a nutshell, it’s an extremely fast type of computer memory which temporarily stores all the information your PC needs right now and in the near future. It’s where your computer loads up all the things it thinks it will need to find out soon, so that when it does need something, it can read it super fast. It’s quite different from your system’s storage, like its hard drive, where information is stored long term. If this is all semantics to you and you just need to know how to install some RAM, or want to find out how much RAM you need, we have guides for that, too. Perhaps the best analogy for what RAM is to think of it as like your system’s short-term memory. It’s quick at learning new things and can load in all of the information about your web browser, the image editing tool you’re using, or the game you’re playing so that you can access it quickly. You don’t want to have to dig through your slower storage, like a hard drive or even a solid state drive (SSD) every time you want to open a new tab or load a new enemy to shoot. As fast as they are compared to storage of years gone by, they’re still far slower than RAM. Data that’s in the short-term memory, or RAM, can be read from anywhere at almost the same speed and because it has a hard-wired connection to your system, there’s no real latency in cabling or connection. Like short-term memory, though, RAM is not designed to stay focused forever and is ready to move on to the next task at a moment’s notice. It’s what is described in computing as “volatile,” that is, once it loses power, it forgets everything it’s learned. That makes it perfect for handling the multitude of high-speed tasks that your system throws at it on a daily basis, but it’s also why we need storage systems like hard drives and SSDs, to actually hold our information when you turn your system off. 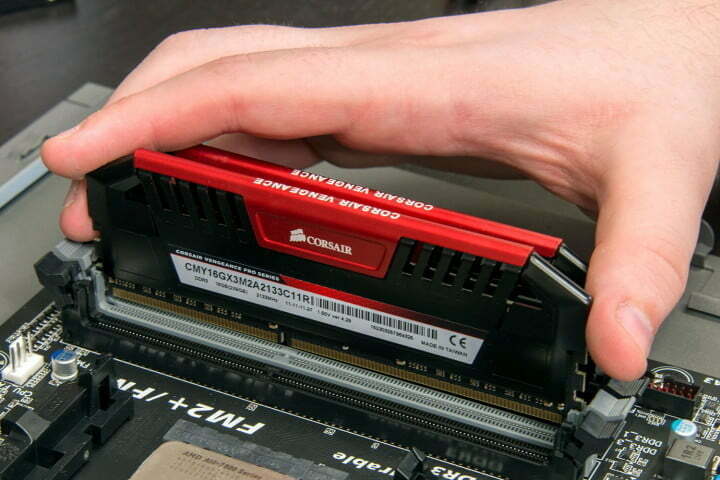 RAM is a bit of a catch-all term, like “memory,” and actually covers a few different types. Most of the time when people are discussing RAM or memory, what they’re actually talking about is technically DRAM (dynamic random access memory), or more accurately for modern systems, SDRAM (synchronous dynamic random access memory). The terminology doesn’t really matter beyond technicalities, but it’s useful to know that the terms are relatively interchangeable colloquially. The most common type of RAM that is sold today is DDR4, though older systems may use DDR2 or DDR3. Those simply denote the generation of RAM used in that particular system, with each successive one offering faster speeds through greater bandwidth — a higher megahertz (MHz) rating. Each generation also saw physical changes, so they are not interchangeable. Another common term, especially in the video game space, is VRAM, or video RAM. Although once a standalone piece of technology in its own right, VRAM is today used to denote the memory available to a graphics chip or built on to a graphics card. That’s actually called Graphics DDR SDRAM, or more commonly GDDR. Most modern graphics cards will use GDDR5, though some use a newer GDDR5X standard and Nvidia’s new RTX Turing graphics cards use GDDR6. Some niche graphics cards utilize a form of RAM called High-Bandwidth-Memory (HBM and HBM2) which has some unique performance advantages, though it is typically expensive and supply issues have meant it hasn’t seen widespread adoption. The biggest consideration when buying RAM is how much of it there is. You need a minimum amount of RAM to run a desktop or laptop operating system and many games and applications have a minimum amount, too. Those requirements are listed in the gigabytes, or GB, and are often between 1GB and 8GB, depending on how demanding the application is. Having more than the minimum is important, as you’re unlikely to just be running one application at a time, but having massive amounts doesn’t necessarily make your system faster. It’s also not the only aspect of RAM that’s important. While more gigabytes of RAM can help with multitasking, you can see more improvement in the speed of your system, certain games, and applications, through using faster memory. Memory, like CPUs, has its own clock speed, which effectively controls how much data it can handle per second when combined with a few other factors. The total speed of the memory is discussed as bandwidth, in megabytes per second, but traditionally memory is marketed with a MHz speed. Typical DDR4 memory runs between 2,133MHz and 3,000MHz but there are some that can run upwards of 4,000MHz for the fastest kits available. You would see these marketed as DDR4-2133 or similar, and sometimes with the confusing “PC” label applied too. The number that follows that is simply the MHz speed multiplied by eight and then rounded. You might see it listed as DDR4-2133 PC4-17000, for example. Timings are another aspect of memory that can have an impact on RAM performance, though they aren’t as important as they used to be. It’s effectively the time between clock cycles, and as memory speed has increased, timings, or the latency of the memory, has increased (gotten slower) too. Typically it’s listed as several numbers separated by dashes, such as 15-15-15-35, or similar. When it comes to buying memory, timings are only really important if you’re considering high-performance memory for benchmarking or top-tier gaming and aren’t of real concern to the average consumer. Lastly, it’s important to know about channels. Most memory sold today is at least dual-channel, and it allows two sticks of RAM of the same type and speed to operate faster by providing better access to the CPU’s memory controller. However, high-end RAM kits sold with three or four modules may support triple or even quad-channel memory. In practical purposes, it doesn’t make a huge difference to everyday performance, but if you want to take advantage of dual or more channel memory, you just need to make sure to install it all in the right colored slots on your motherboard. Check your manual for help on that front. RAM is very important in that your desktop needs it to run and tablets or smartphones without much of it tend to run very slowly indeed. However, will having tons of it or the highest MHz rating mean your system is super fast? Not necessarily. Having enough RAM matters and having RAM that isn’t bargain basement slow is a good idea, especially if you plan on doing complicated image or video editing tasks, or playing games that tend to be CPU limited. However, when it comes to improving your system’s overall performance, it’s important to weigh up the costs involved. A faster CPU or graphics card is almost always going to have a bigger impact on your systems’ overall speed than faster memory, though some CPUs, like AMD’s Ryzen line, do benefit more than others from faster memory. Upgrading from a hard drive to an SSD is also a big step if you haven’t taken it yet, as that speeds up by far the slowest storage on your system by a huge margin and contributes massively to making it feel more snappy. As with any computing device, you are usually limited the most by your slowest component, so slow memory can hold you back if it’s the worst part of your configuration. Unless you’re doing anything particularly intensive though, just make sure you have a little more than what you need and that it’s not the worst available, then you’ll probably be fine. If you want something more powerful there are a wide array of configurations of speed, size, and latency for you to choose from. Some even have RGB LED lighting, too.